Standing in line was easy this year. No rain, no snow. 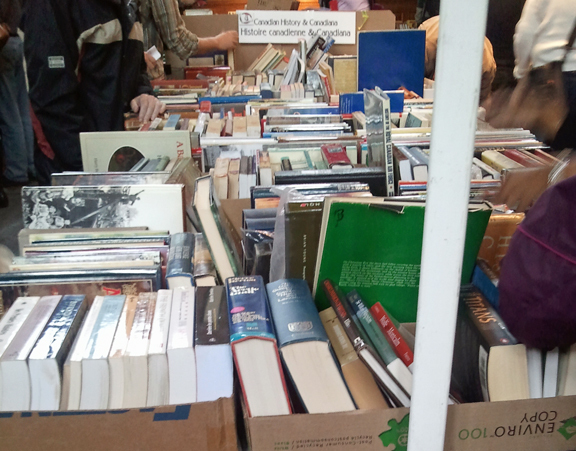 Every year there is a two day event where literally thousands of books change hands. 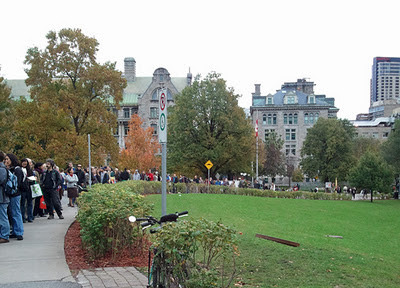 Every year I stand in line on the campus of McGill University, through rain or snow, and wait patiently for those magic doors to open. Behind them lay treasures that only us bibliophiles can appreciate. Books on every subject you can think of. History, biographies, cookbooks, travel, business, media, literature, rare and antique, Canadiana, religion, plus plus plus. Books that have been collected, sorted, and stored for the entire year ready for a sale which raises money for university scholarships and bursaries. The McGill Book Fair is one of my favourite events of the year. It's right up there with the Paris Salon du Livre et Papiers (which I adore). Books sell for $0.50 up, and truly are bargain prices. 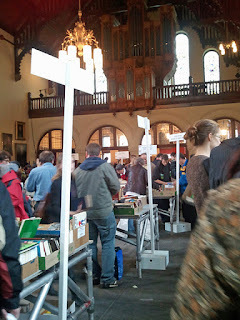 But, I read in the Gazette (thanks for sending Jeanne) that this was the very last book fair at McGill. The volunteers who organize this huge event are getting on in years and no one is stepping in to replace them. I understand - it's a huge job, physically demanding, and these days it's hard to find the time for this kind of commitment. "I've been searching for this book for years! I don't care what the price is, it's finally mine"!! He then announced the cost was $2.00. I know just how he felt. It's a discovery. It's a find. It's a personal achievement to find that elusive title. I'm happy with Amazon and other on line stores. I download e-books too. But honestly, there's nothing like going through used books and discovering a title you've been trying to find, or didn't know existed. 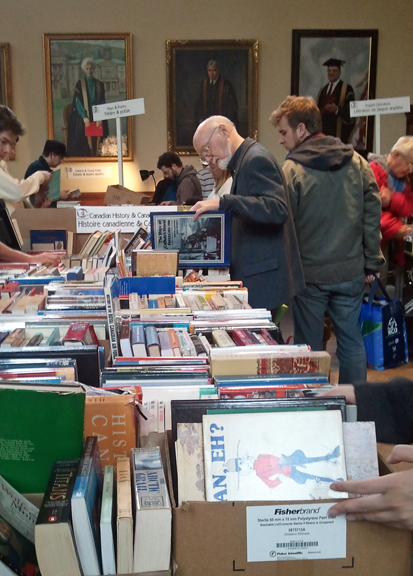 I'll truly miss the McGill Book Fair and so will all the others who've been faithfully attending year after year. Thanks for all the gems you've given us. We're all richer for your wonderful work and we'll miss you! Interesting. Each college at the University of Toronto has a book fair at this time of the year. My husband loves them. McGill, eh. I have a boy in Grade 12. This gets me thinking. McGill is a great university depending on what one is studying of course. I'm so sad about this being the last fair at McGill. I even booked our Paris trips around it! 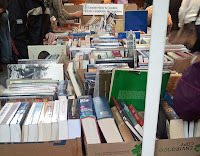 I have been volunteering for the Lifeline Bookfair in Sydney Australia for 5 years. It is one of the best voluntary jobs I do. We raise over $150,000 each year for Lifeline and the best part is I get to see the books before they go sale at the Bookfair! I envy those of you who actually work on book fairs and get to see all the books first. If I was starting over, I'd be a researcher or librarian. I'd be in heaven!